Gladys H. (Sullivan) Davis, 102, of Newton died on Wednesday, September 12, 2018, at Skiff Medical Center. A funeral service will be held at 10:30 a.m., Monday, September 17, 2018, at the Wallace Family Funeral Home and Crematory. The family will greet friends from 2-4 p.m., Sunday, at the funeral home. Memorials to the Pleasant View United Methodist Church or the Jasper County Historical Society may be left at the funeral home. Gladys, the daughter of Asa and Mary (Remmark) Sullivan, was born on January 4, 1916 in Sheriff, Iowa. She moved to Colfax and later to Newton in 1928. Gladys graduated from Newton High School in 1934 and took normal training to be a School Teacher. On June 23, 1937, Gladys married Frank Davis in Newton. Nine years later they built a home on the Davis’ family farm outside of town. Gladys was a homemaker and farmer’s wife, keeping an extensive garden and canning food to provide for her family. 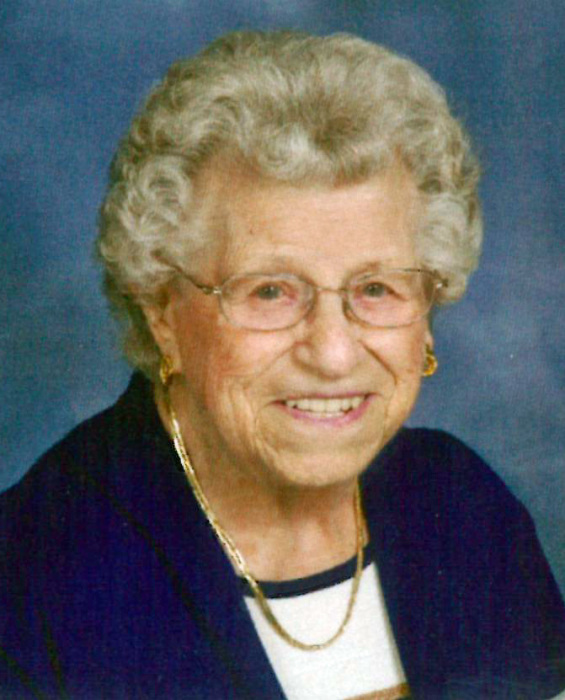 Gladys was an active member of the Pleasant View United Methodist Church for 68 years, teaching Sunday School, serving on the church board, and being a part of many women’s clubs. She was currently serving as the church historian. Gladys and Frank enjoyed camping and going to the fair, where Gladys worked at Pioneer Hall for many years. They liked traveling and going on family fishing vacations. In addition to being members of the Jasper County Historical Society, they also served as Docents at the museum. Gladys had served as a 4-H Leader and volunteered at the Jasper County Senior Citizens Center. She enjoyed collecting stamps, coins, and tea sets and had won multiple blue ribbons for making doll furniture and coasters out of plastic canvas. Gladys was a member of many card groups. She also had a knack for memorizing poetry, some of which she learned back in Kindergarten, and doing crossword puzzles. Gladys is survived by her daughter, Sharon Jolley of Newton; son, Thomas W. Davis of Newton; daughter-in-law, Catherine Davis of Newton; four grandchildren, Jeff (Kelly) Jolley, Jason Jolley, Erik Davis, and Jennifer Newman; four great-grandchildren, Shad Jolley, Jessica (Zach) Sudbrock, Isabelle Jolley, and Jordyn Newman; her great-great-granddaughter, Clarke Sue Sudbrock; and many nieces and nephews. She was preceded in death by her parents; husband, Frank Davis; son, Jon C. Davis; son-in-law, James Jolley; and her siblings, Clifford Sullivan, John Sullivan, Florence Northcutt, and Helen Couch.